Q 1: why without screw thread on the screw hole? thread, This would result in the whole fan not being able to be fixed or be used. Q 2: why so hard to screw in with a screwdriver? have a large screw head design. Although the "small screwdriver" can be barely screwed, but have to spend a lot of effort to do so, and it is easy to make the screw slip out. THE SIZE OF 120MM-compatible with various types of chassis, suitable for CPU type water-cooled radiator. The speed of 800-1800RPM + 10%, multi channel inlet design, collocation innovation aerodynamic inlet design fan and LED lights, very cool operation. STANDARD 12CM SIZE-Compatible with all types of chassis,Suitable for water cooling,Cold discharge light effect, CPU radiator, side through version of MOD light efficiency of fan position in cabinet,Different angles and light show different visual effects. 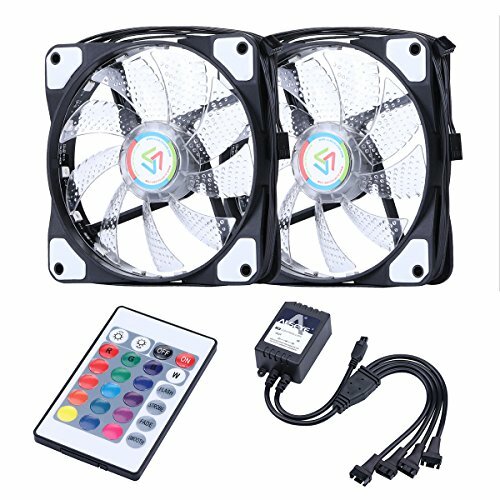 WIGBOW DESIGN-Silent noise reduction,That 8 damping silicone pads fixed on both sides of the fan frame is to reduce the noise of the polarization motor vibration. If you have any questions about this product by Wigbow, contact us by completing and submitting the form below. If you are looking for a specif part number, please include it with your message.